The Organic Growers School is collaborating with Blue Ridge Women in Agriculture to teach their Farm Dreams class November 11th, 2017 at the Watauga Cooperative Extension’s Conference Center. Are you dreaming of starting your own farm? Farm Dreams? is an entry level, three-hour, exploratory workshop designed to help people who are seeking practical, common sense information on whether sustainable farming is the next step for them, and how to move forward. This is a great workshop to attend if you are in the exploratory stages of getting started farming. During this class, you will learn about sustainable farming careers in Western North Carolina from farmers in your area. 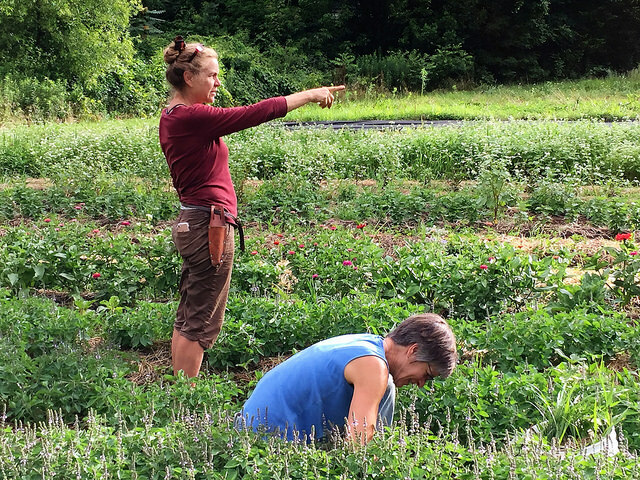 Boone’s Farm Dreams will have a farmer panel featuring Kathleen Petermann, the farmer and operator of Waxwing Farm which was first started in 2012 at the Farm Incubator and Grower (FIG) Project farm in Valle Crucis. In 2014, Kathleen moved to the site of Maverick Farms to manage the land as Waxwing Farm. Kathleen graduated from Appalachian State University’s Sustainable Development Department with a degree in Agroecology. The panel will also feature Julia McIntyre who owns and operates a local micro farm and vacation rental home in Boone, NC with her husband, John. Julia managed 2 farmers markets in Watauga County during the 2017 growing season, including starting Boone’s new weekday farmers market, the King Street Market. The panelists are excited to share their real-world experience with the Farm Dreams class. During Farm Dreams you will be led to discover and assess your resources, skills and farming intentions, begin to develop an educational plan toward farming, prioritize your next steps toward your farming goals and connect with regional resources and support services. The course is open to aspiring, beginning and expanding farmers in Western NC and surrounding Southern Appalachian states – Tennessee, Virginia, Georgia, and South Carolina. Blue Ridge Women in Agriculture (BRWIA) is dedicated to strengthening the High Country’s local food system by supporting women and their families with resources, education, and skills related to sustainable food and agriculture. They this by providing opportunities for women farmers to share knowledge, hosting a Farm Tour, providing opportunities for consumers to learn about self-sufficiency and connecting everyone to our local agricultural heritage and landscape. The Organic Growers school has been providing organic education to farmers and home growers since 1993. The organization grew out of the volunteer efforts of a group of farmers and extension specialists who gathered to discuss the need for nuts and bolts, region-specific crop growing information applicable for farmers in Western North Carolina. From this meeting, OGS was born, along with a mission to deliver practical information about organic agriculture at a reasonable price.. Organic Growers School is the premiere provider of practical and affordable organic education in the Southern Appalachians, building a vibrant food & farming community by boosting the success of organic home growers and farmers in our region. Farm Dreams registration can be made at www.organicgrowersschoo.org/farmers/farm-dreams and it is also listed on our Facebook page here. The cost is $55/person or $35 for High Country or WNC CRAFT Members.